Eight teams will compete against each other in Round Robin tournament. SANTA BARBARA—College sailing returns to Santa Barbara as the local University of California campus will host the Pacific Coast Collegiate Sailing Conference (PCCSC) Team Race Conference Championship, April 6-7. The race will determine which team represents the conference at the national competition. A fleet of 18 CFJs will be used for the regatta, with boats and sails provided for the eight participating teams. The entry fee is $200 per team, which covers the cost of umpire boat rental and umpire expenses. 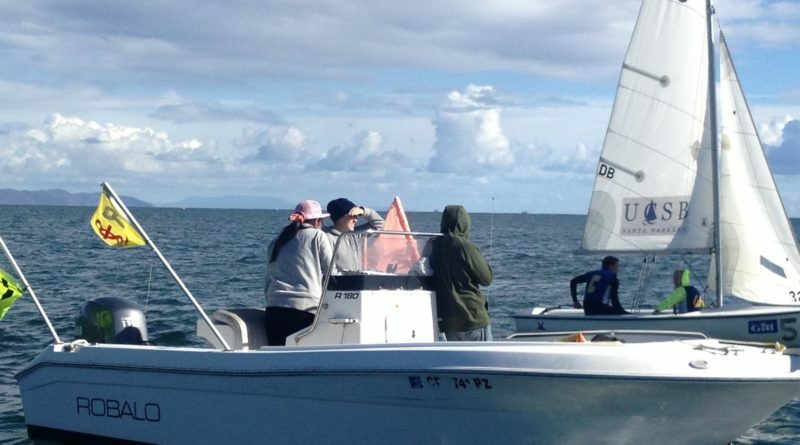 Festivities kick off on April 6, with sailors asked to report at 9:30 a.m. at the UCSB Sailing and Boating Facility. A competitors meeting will be held at 9:45 a.m. The first warning signal is at 10:30 a.m. near the Santa Barbara Harbor entrance. Racing continues on April 7, with the report time at 9:45 a.m. and first warning signal at 10:30 a.m.; the final warning signal would be given at 4 p.m. on April 7. The racing area will be provided at the competitors meeting.